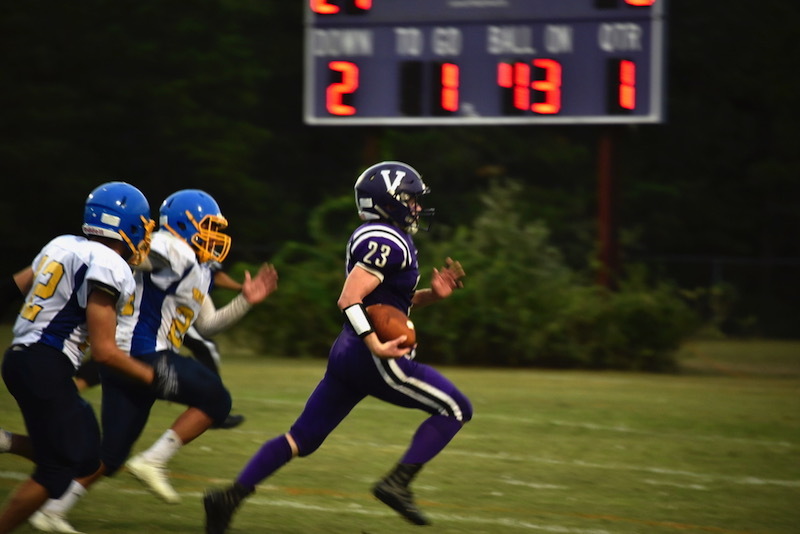 Running back John McCormick is way ahead of the pack, scoring two touchdowns as the Vineyard cruised to an easy victory. 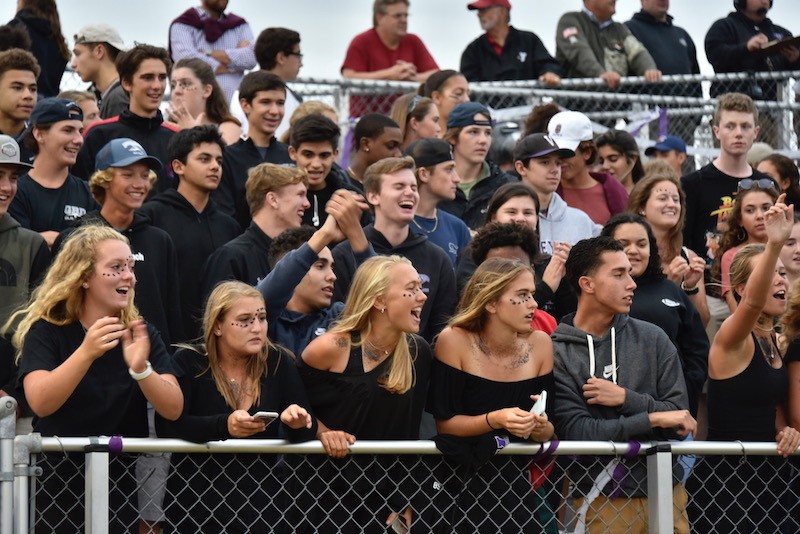 The Martha’s Vineyard Regional High School football team made Friday night’s opening game of the season one to remember with a commanding 55-0 victory against the Atlantis Charter School Tritons. The game marked the triumphant return of Coach Don Herman, who looked at home under the Friday night lights after a two-year hiatus. With less than two minutes played, the purple and white was up 7-0. 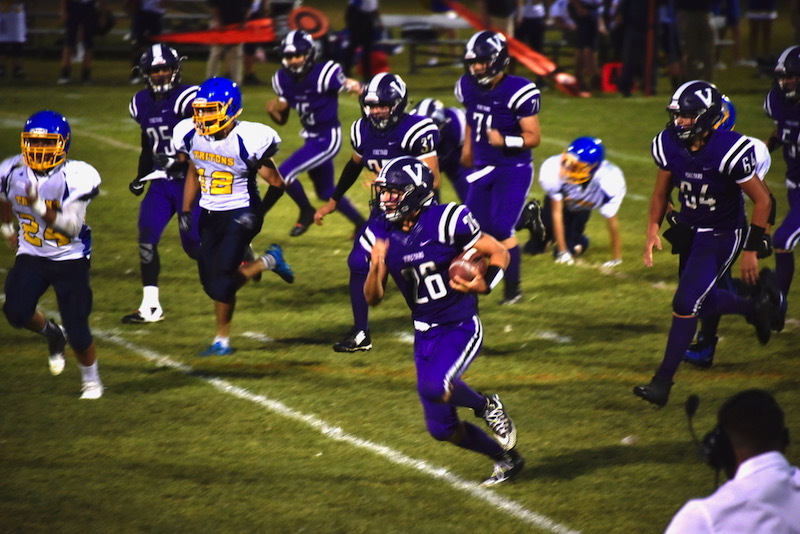 The bleachers were packed and the fans on their feet for the next few minutes as the Vineyard scored two more quick touchdowns, one the result of another Shepard run, the other coming from running back John McCormick. One of the drives took only 38 seconds. It was lights out football by the Vineyarders from then on. Coach Herman ran through the playbook and his players put on a show of fake handoffs, screen passes and even a two-point conversion. Other first half highlights included a 33-yard pass from Shepard to freshman Antone Moreis, who caught the ball while falling backward into the endzone, and a 30-yard touchdown dash by junior running back Patrick Ribeiro to make the score 34-0. With the score 41-0 at the half, the coaches of both teams agreed to play the second half with a running clock to speed up the game. Coach Herman put the second team in to finish out the game, ensuring that everyone got playing time. Stands were packed for return of Friday night lights! Backup sophomore quarterback Zach Smith snuck in his own “keeper” to make it 48-0 four minutes into the third quarter. Big sacks and tackles from freshmen defensive back Jayden Coyle and sophomore defensive back Alyssa Strelecki kept the Tritons from mounting any sort of comeback, with most drives fizzling out without a first down. 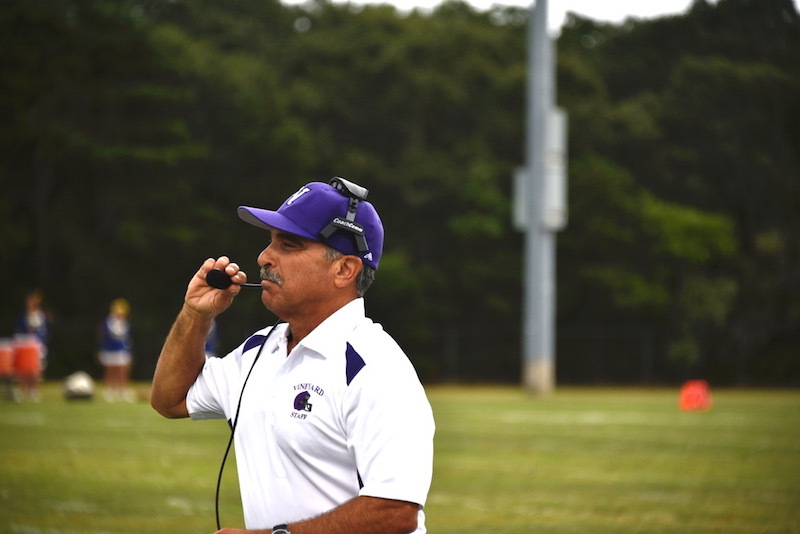 Spectators took a moment in the third quarter to recognize longtime Vineyard sportscaster and coach Norman Vunk, who passed away from cancer last fall. Students and cheerleaders at the game wore black shirts inscribed with “Say Goodnight Norm” to honor his memory. The game’s outcome was assured, but the Vineyarders didn’t let up as the clock dwindled down, and saved the best touchdown for last. McCormick did the honors, catching a pitch from Smith and running for 58 yards to the endzone. The clock hit zero and the team rushed out onto the field to celebrate their first win of the season. Fans gave a standing ovation. Props were also given to the cheerleading team, who performed 246 jumping jacks to keep up with the Vineyarders constant scoring. Mr. Herman was all smiles as he walked away from the final huddle, patting players on the back and praising them for their powerhouse performances. He said the defensive squad will get pizza for making it a shutout, but warned that they shouldn’t get too cocky one win into the season. The next match-up is against Saint John Paul II High School, a team that made it just one game shy of the division eight south finals last year. The Vineyarders next play at home against Saint Paul on Friday, Sept. 14 at 6 p.m.